McAllen resident Edna Sosa carried her 8-month-old grandson, Kai, through the aisles of firs under the tent of Farmers Select Christmas Trees in McAllen. As her children develop their traditions with her eight — soon to be nine this week — grandkids, Sosa and her husband of 38 years are returning to a tradition of their own. After years of celebrating with artificial trees which were assembled after Thanksgiving, she was buying and raising their tree on her birthday: Dec. 4. “This year, we decided to go back to the beginning,” Sosa said. “This just makes it seem more like Christmas. Because Thanksgiving was early this year, so was the rush for trees, said Farmers Select Christmas Trees owner Jim Connors. 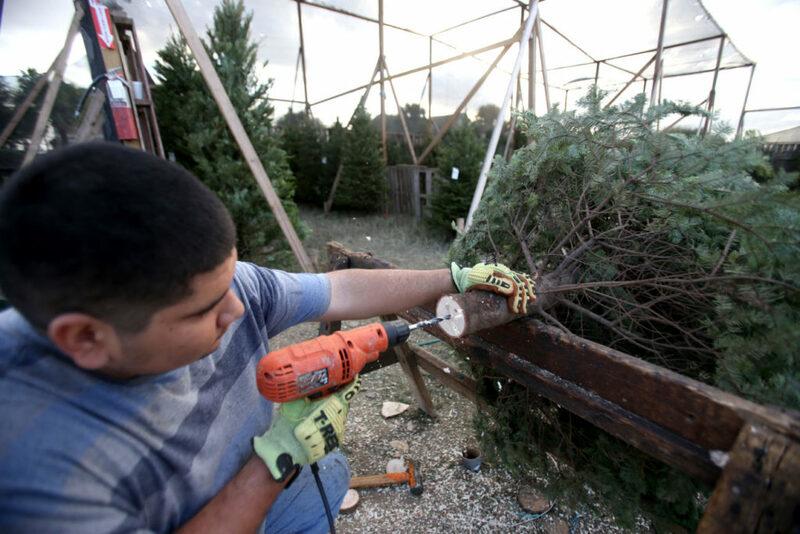 “We bring in the same amount of trees every year, and this week we’re going to sell out two weeks early,” he said, adding they’ve sold about 2,500 in three weeks. Connors used to have multiple locations but consolidated the operation to the corner of McColl Road and Nolana Avenue. They’ve been at this spot for nearly two decades. Holes are drilled into the bottom of trees where spikes on stands are inserted to help them stand upright. If you’re looking for a towering 17-footer, most of the large trees are sold. But seasonal stands around the Rio Grande Valley, like Farmers Select, have trees that vary in height, fragrance potency and clean-up required. For those interested in purchasing a Christmas tree, the first step is assessing the space it will occupy, staff says. If it will be against a wall, that would disguise a thinner side of a fir. Also, the width of a tree could depend on how open or tight the area around the tree will be. Connors said flocking — a spray adhesive used to mimic snow — in red and black are popular this season. 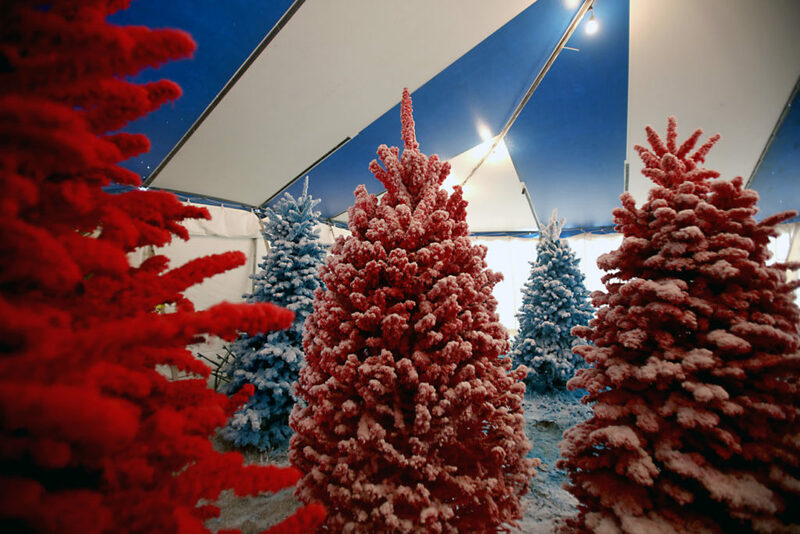 Pink, purple and blue trees stood in the hazy tent where Connors applied white tips on a large red. “We can do anything to a tree,” he said. They’re designed made-to-order, with themes like candy canes or the Dallas Cowboys. But some opt for the classic, fresh tree. Sosa purchased her eight-footer partly because she wanted that smell in her home for the holidays. Because of her family’s hectic schedules, they’ll gather around her tree on Dec. 22, she said, donning pajamas and making new memories. “It’s a hobby to us,” said Connors, who has sold trees for 30 years. 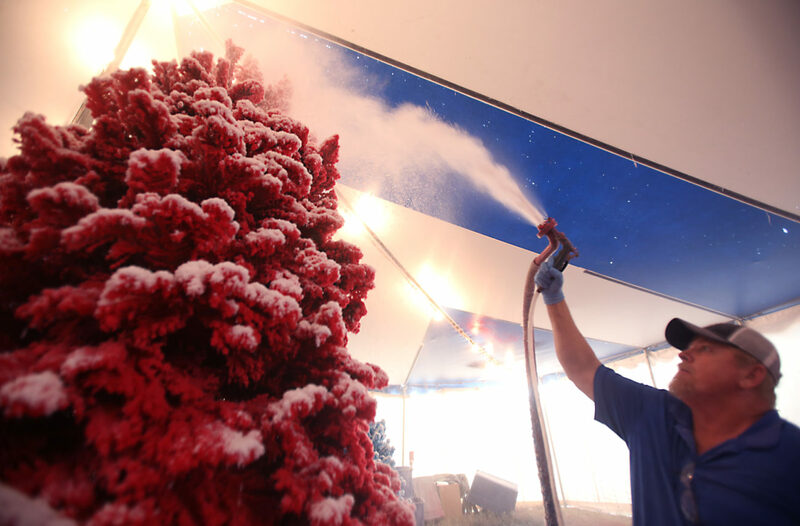 “It’s good to meet the people every year, and people depend on us to get their big trees. Flocking can make a tree any color the customer wants. Black and red trees are in this season, according to staff.